No summer in our area this year (two hot days in July and two in August) – check. Wore favorite perfumes three, sometimes four times a week (better than my New Year resolution of two times per week) – check. Did more testing and less writing – check. * Total number of different notes in all perfumes I wore/tested this month: 268 (+50). 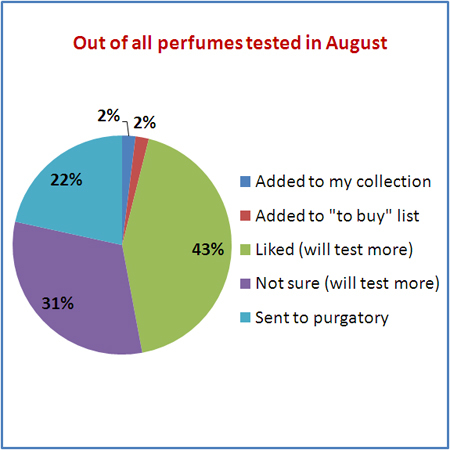 Out of all perfumes I’ve tested for the first time during August one was added to my collection, one went to the “to buy” list, thirty eight I will test more and eleven were sent to the purgatory box. My August posting I wish more people would read – Know-how: Storing Your Perfume Samples. WOW, all that in one month – you’re my hero!! Dying to know which were added or will be added to your collection! And another Chanel is now on my “to buy” list – Cuir de Russie. Undina, thank you for posting the charts — they are inspiring. This Summer I completely neglected my spreadsheets. They don’t seem to be working for me any more. I’ve been thinking how to change them around. Could you share yours or is it too much to ask? I’d love to know how you structure yours, and I can reciprocate – but my way of doing it is quite crazy. I use a database I’ve created in MS Access (I answered slightly more detailed here. It’s still not at the level of ready-to-use application so unless you are hands-on with Access it won’t be of much use to you. I echo Bloody Frida’s “Wow”! Especially for counting all 268 different notes. Carnation and pepper are two of my favourites but yet to find a carnation heavy fragrance I really love. Glad to hear you want to purchase Cuir de Russie, it’s a favourite work perfume of mine. Counting notes is easy – once I enter them into the database. I’ll need to go through the complete list eventually and make sure I do not have duplicates with slightly different names – I might have entered something earlier without realizing that those were the same. Speaking of carnation and pepper, have you tried Oeillets Rouge by DSH? I was amazed how real the carnation was in that perfume. Thanks for the Oeillets Rouge recommendation. I have been interested in it for a while but haven’t tried anything from the line yet. Looks like I will need to remedy that after my disappointment with Bellodgia, Comme des Garcons Carnation and Vitriol d’Oeillets. I’m not even sure how it happens. I wear just one perfume to the office.But if I work from home I usually do at least a couple perfumes in parallel – one on each wrist. And I might do a second pair during the day if the first couple wasn’t too tenacious. In the evening, if I stay at home, I can try one or two more. And if by the time I go to bed those are gone I might wear one of my sleep scents.